This project was created in an effort to improve language skills for children coming from modest backgrounds and attending public schools. The presence of volunteers gives them a chance to acquire language skills they would otherwise not be getting. French is taught at a young age, but not the standards that it should be. English is taught much later despite the increasing need to know English as a universal language. And Spanish is also introduced much later in their curriculum, despite the commercial opportunities between Morocco and Spain as they share the Strait of Gibraltar. Language classes tend to be overcrowded and often have diverse ranges of ages and abilities making teaching more challenging. With some creativity and assistance from the local teachers, the volunteers can help raise the standards and unleash the local students potential, while allowing the learning of languages in a much more efﬁcient way. Language skills are essential, and in a country with a few language teachers, international volunteers are greatly needed. That said, the schools welcome volunteers of all background that will be able to help the students acquiring important skills for a brighter future. This is the perfect placement for anyone interested in inter-cultural exchange beneﬁting both local students and the volunteer alike. Teaching your mother tongue to the local students will improve the future prospects of some of the most impoverished children and help them break the poverty cycle. As a volunteer, you will learn a great deal from the experience, work with amazing children and learn about Morocco’s people and culture. You will also gain a deep understanding of Morocco’s educational system and society in general. This project allows you to add on some Arabic or French classes for yourself depending on your mother tongue. The fee is minimal and learning the local languages could help you leverage your volunteering even more. Just let us know in advance so this can be arranged. If interested in an extensive placement, or getting credit for this volunteer experience, please speak to one of our advisor on how this placement could be turned into an internship. The volunteers play an integral role in achieving the goals of this project. Volunteers provide language classes in English, French or Spanish. They will work with the local teachers to deliver the curriculum. They will help the students improve their pronunciation and conversational skills. As they settle in, volunteers will be given the freedom to create and carry out their own lessons. The volunteers’ willingness to share and be proactive in their role will make a valuable addition to any classroom. Obviously mastering your native language is a requirement for this project. Also, patience and the love for teaching or mentoring will help you be successful during your time on this placement. You will be lodged in a typical recently renovated Riad in the middle of the medina. The Riad is conveniently located nearby the famous Rue des Consuls well known for its shopping. You will share your bedroom, breakfast, and dinner with fellow interns and volunteers. The Riad is simple but comfortable with westernized bathroom and toilets. Rabat is amazing with its maze-like streets, beautiful hidden mosaic fountains. markets and food streets vendors. You will be able to explore it during your spare time. Don’t miss out to visit the Kasbah des Oudaias palace and the Hassan Tower. 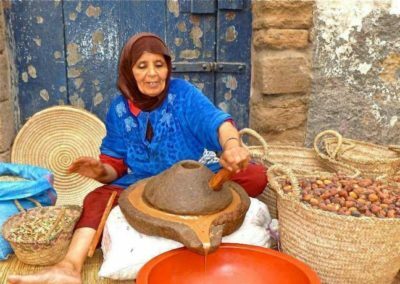 Rabat is also a great central location to plan day trips or weekend trips to the Sahara Desert, Casablanca, Fes, Marrakech, and many other local spots.